Now that Spring is about to spring out at us, it's time for fashionistas everywhere to revamp their wardrobe! You'll be surprised about some of the new (and old) trends that are in style again. This year, girls who were should have been born in the seventies can summon their retro vibes because retro styles are in! Ballerinas all across the world can also unite because ever since the movie Black Swan came out, ballet has been nothing but back! 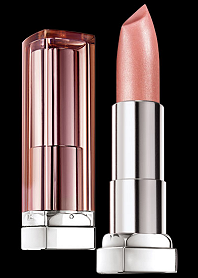 For those who love a sweet pucker, coral lipstick is the hottest color this season - sweet, fun, and flirty. Seriously, it looks great on everyone! And for those casual dressers (we haven't forgotten about you guys! ), denim is always in style. This spring, bold is beautiful (but when it is ever not?) and florals are flowing back into our closets. So what are you waiting for? Get stylin'! The glam seventies/eighties look is back, but less intense in 2011 than it was thirty or forty years ago. Pair up any bright colored t-shirt or dress with a different color belt and you've got yourself a hip attire. Paint nails bright and pin your hair up! A dash of gold accessories works as well, along with anything poppy and retro. This luxe look brings confidence without the big bad hair and the gnarly poofs. Long dress (left) is available for $24.80 at forever21.com or your local store. Dress (right) is available for $17.80 at forever21.com or your local store. Once you go black, you never go back. Ever since Black Swan danced its way into theaters, flowy skirts, wrap tops, and flats have found their way back into the hearts of romantics everywhere. Great news for tall girls, earthy tweens, and everyone in between. This is the ultimate comfy look that's bound to attract anyone. When you feel comfortable, you act comfortable. 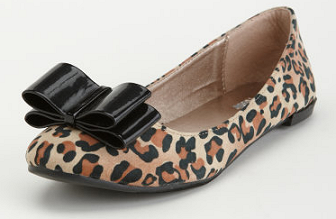 Ballet flats are available for $19.50 at charlotterusse.com or your local store. The hottest lipstick color of the Spring season is coral. Fashion designers like Marc Jacobs, Chanel, and Marni and Mulberry can't get enough of it and this season's 'It color' has been ever present on the runways. Maybelline Cosmetics carries this cute bright color for fewer bucks. Lipstick is available at maybelline.com or your local store. As per usual, denim is always trendy and in style. For the northern states, denim jeans are a must in every girl's wardrobe, and for the southern states, shorts are now starting to appear amongst young adults. Denim dresses have also been popping up as well as denim pencil skirts and rompers. 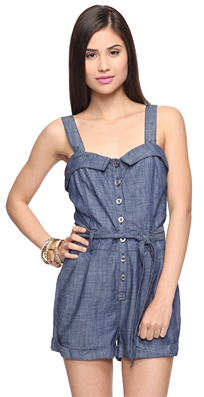 You can dress it up or down - denim is definitely the one piece of clothing that's ever-changing and flexible. Both rompers (above) are available for $24.80 at forever21.com or your local store. Dress is available for $22.80 at forever21.com or your local store. Being bold has never been a mistake. We always want to be that confident, risk-taking girl that everyone's eyes are glued to. Fake it to make it! Wear a flirty red blouse or a bright sunny yellow top (it'll even make you feel happy!). Anything that packs punch just wreaks power. If you're not sure what color goes best with your skin tone, go to your favorite store and experiment with the different colors of the spectrum. Also in? Bold stripes. Yellow top is available for $17.50 at wetseal.com or your local store. Back in Spring comes a HUGE style that's hitting almost every department store. Asian-inspired clothing blooms this season, with Gap, Loft, and DKNY all opting for this precious oriental look. Come Springtime, flowery rompers, pencil skirts, and dresses will all have flowers and other buds enamored onto their seams. Try it out! You won't be alone. Models for Paul Smith have already hit the runways in their chi-paos (Chinese word for silk dresses that hug). Stores like Forever 21 have made the trend a bit more youthful with shorter dresses and more fabric, less silk. 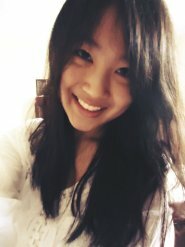 Dresses are available for $12.40-$13.50 at forever21.com or your local store. Dress is available for $26.50 at charlotterusse.com or your local store. There you have it! Remember though, trends come and go, but confidence is always in style! With confidence and inner beauty, girls can make anything in style. And no outfit is ever ready without a smile.